Grafton Architects has been selected to design a new faculty building for the London School of Economics and Political Science (LSE) in Holborn, seeing off a shortlist of prestigious firms. 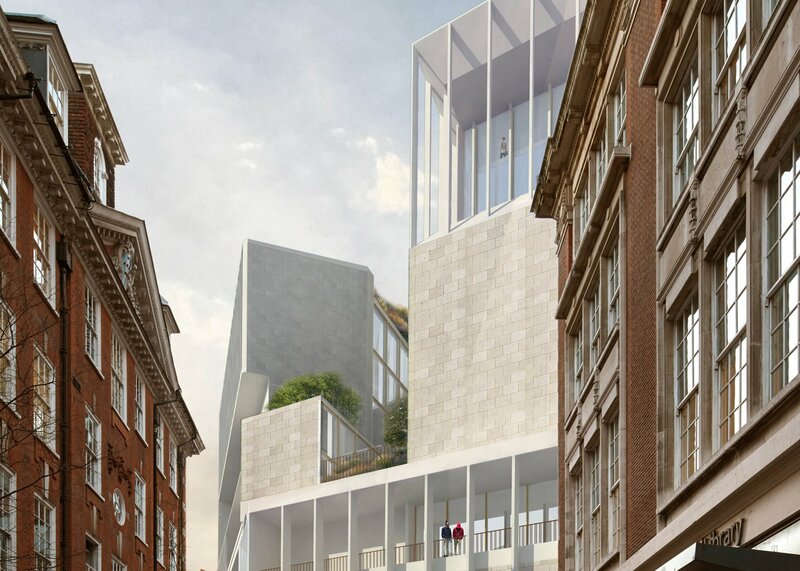 The Dublin-based practice headed up by architects Yvonne Farrell and Shelley McNamara will design The Paul Marshall Building for a site at 44 Lincoln's Inn Fields, which the university bought from the charity Cancer Research UK in 2013. Renderings produced by the firm show a building faced in pale stone with a series of planted terraces. Inside, a dramatically curving staircase connects teaching spaces set around an atrium with a branching structure of columns and beams. "We are absolutely delighted to be given this opportunity to build in this unique location in Lincoln's Inn Fields, across from the wonderful Sir John Soane's Museum, for a visionary client such as LSE," said Grafton Architects. The Irish firm saw off competition from five other teams shortlisted in the RIBA-run design competition, including London studios AL_A, David Chipperfield Architects, and Niall McLaughlin Architects and Scott Brownrigg. Swiss firm Herzog & de Meuron and a joint team made up of New York practice Diller Scofidio + Renfro and London-based Penoyre & Prasad were also among the finalists. The Paul Marshall Building will house teaching, sports and arts facilities for LSE's accounting, finance, management and research centres as well as the Marshall Institute for Philanthropy and Social Entrepreneurship. Renderings show the 10-storey building, which includes two basement levels and a split-level roof terrace, slotted into the place of an existing red brick structure. "We believe Grafton's design has the potential to provide LSE with a distinctive and seminal piece of university architecture, which expresses the values and aspirations of the school," said estates director and jury member Julian Robinson. "Combining modernity and tradition we felt it would enhance Lincoln's Inn Fields and connect well with the rest of LSE." "Their creative design is formal but also fun, and I have no doubt will further enhance LSE's status as a university with an estate that matches its global academic reputation," added LSE director Craig Calhoun, who also sat on the jury for the competition. RIBA president Jane Duncan, and the building's benefactor and namesake Paul Marshall were also among the eight-strong jury. Marshall, a British investor, donated £30 million towards the creation of the Marshall Institute for Philanthropy and Social Entrepreneurship and the redevelopment of 44 Lincoln's Inn Fields. This is the third time the school has held a RIBA-organised competition for new faculty buildings. Irish architects O'Donnell + Tuomey completed a faceted red brick student centre for the university in 2014, and a new centre for social sciences by Rogers Stirk Harbour + Partners is in the pipeline.